Once again, end of month fell on a weekend, so I'll be doing a monthly update rather than a weekly. On Friday, gold fell -1.86 [-0.15%] to 1228.09 on light volume, while silver dropped -0.13 [-0.94%] to 14.25 on moderately heavy volume. The buck rose +0.51%, a strong move, which definitely pulled metals prices lower. Also at play was the accelerating collapse of platinum: platinum dropped -2.50%, and I suspect that helped pull the rest of the metals lower as well. Late-breaking news: on Saturday following the G-20, Trump and Xi have agreed to a "trade war ceasefire" - the imposition of 25% tariffs will be postponed for 90 days while the US and China work on settling their issues. More detail in the geopolitics section. This news is certain to affect prices on Monday. We are in what an old teacher of mine used to call "a news-driven market." 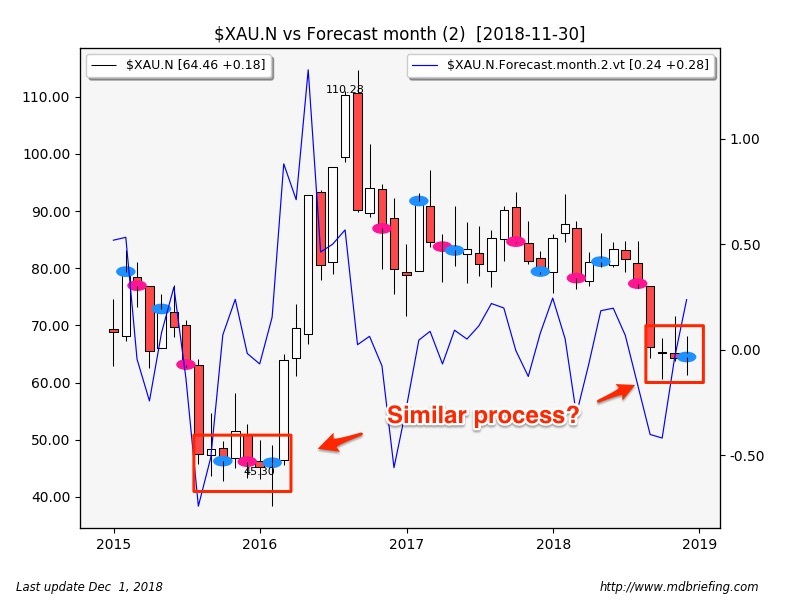 This month, the metals sector map shows an interesting divergence: while palladium and copper have done well, platinum did worst of all, with gold and silver in the middle of the pack. Gold led silver, senior miners led juniors; that's bearish. Something is up again with platinum - perhaps it is related to the auto industry. Gold rose +7.62 [+0.62%] this month. 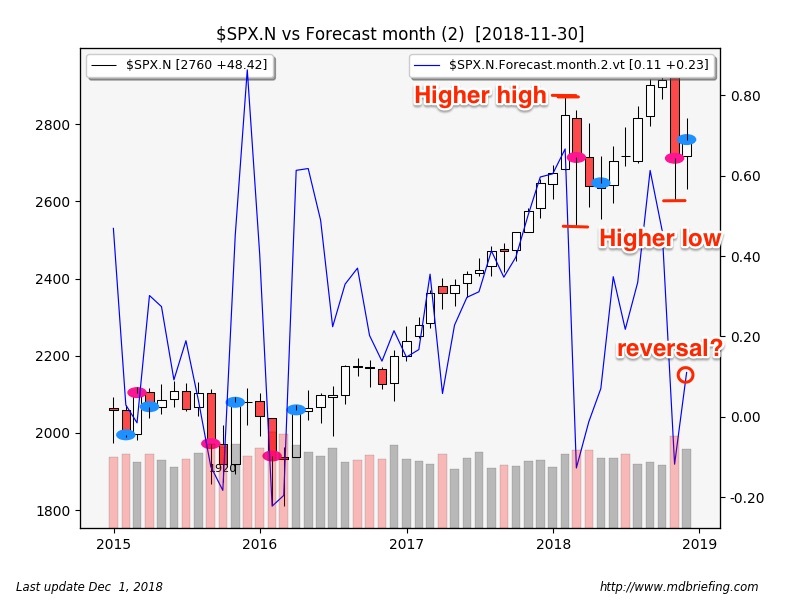 The short white/spinning top candle was unrated, the monthly forecaster did move higher but it was not quite enough for a buy signal, nor enough for a swing low. Things are improving, but only slowly. Gold/Euros monthly is in an uptrend - it issued a buy signal last month. The December rate-increase chances rose to 83%. COMEX GC open interest fell -88.9k contracts this month; the drop occurred during the past week, which saw the largest weekly drop (-132k contracts) in the history of the GC contract. What does this mean? I don't think its bearish. COT report shows commercial net rose +7k contracts, which was 29k longs sold, and 36k shorts covered. Managed money net fell -6.5k contracts, 4.4k longs sold, and 2.1k shorts added. The change in net was negligible this week. Commercial net remains at near-record (high) levels. 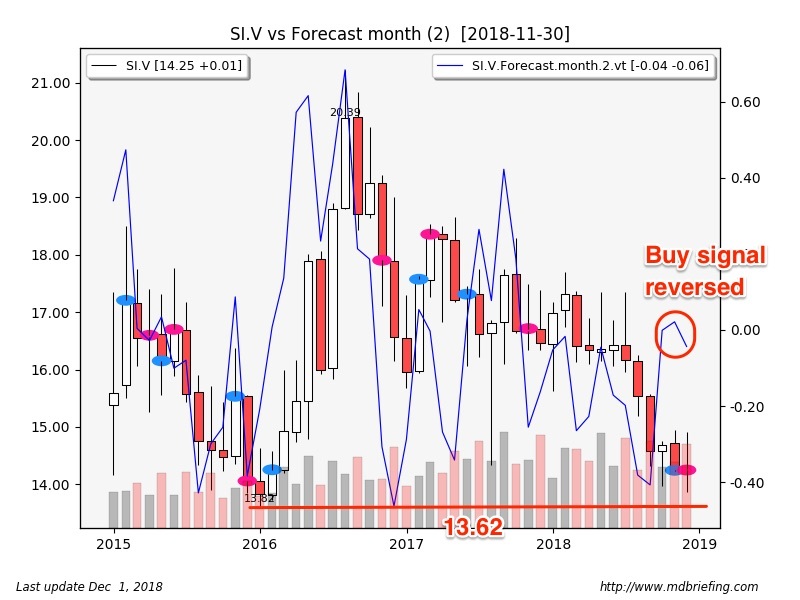 Silver rose +0.01 [+0.04%] this month, making a new low to 13.86, but managing to bounce back. The long-legged doji candle was bullish (53% reversal), but forecaster fell anyway, issuing a sell signal. The previous low, set back in Dec 2015, is 13.62. Might we be seeing a replay of 2015? Perhaps. It probably depends on what happens with tariffs and China. The gold/silver ratio rose +0.95 to 86.18. That's bearish. Last time the ratio was this high was back in the 1990s, when silver was trading around 6. COMEX SI open interest fell -24.3k contracts. The commercial net position fell -1.9k contracts; 3.4k fewer longs, and 1.4k covered shorts. Managed money net rose +1k contracts, with 2.6k fewer longs, and 3.7k covered shorts. These were minor changes; managed money remains fairly heavily net short, but is no longer at the extremes. Miners rose +0.28%, basically unchanged. The doji candle was possibly bullish (53% reversal), and forecaster issued a buy signal this month. Over the past 3 months, miners have largely moved sideways, which looks similar to what happened back at the end of 2015, at the lows. The hope of course is that we'll see the same sort of outcome. The GDX:$GOLD ratio rose +0.22% while the GDXJ:GDX ratio fell -3.49%. That's bearish. Those juniors aren't doing so well. The buck rose +0.13 [+0.13%] this month, more or less unchanged. 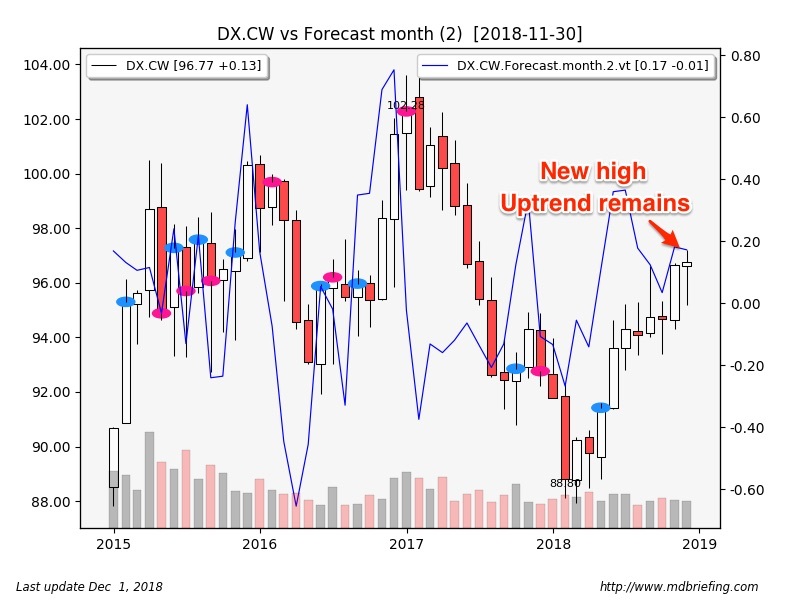 The buck made a new high to 97.18; the doji candle was a bullish continuation, and forecaster remains in an uptrend as it has for 8 months. This month, DX currencies were mixed; the buck rose against CAD and JPY, and fell against CHF, and AUD, while EUR was more or less unchanged. The buck fell against most emerging markets currencies; there were some pretty big moves (TRY:-6.65%, ZAR:-6.17%, INR:-5.87%). SPX rose +48.42 [+1.79%] to 2760.16. SPX managed to avoid making a new low, and rallied strongly over the past week back up to the 200 MA. 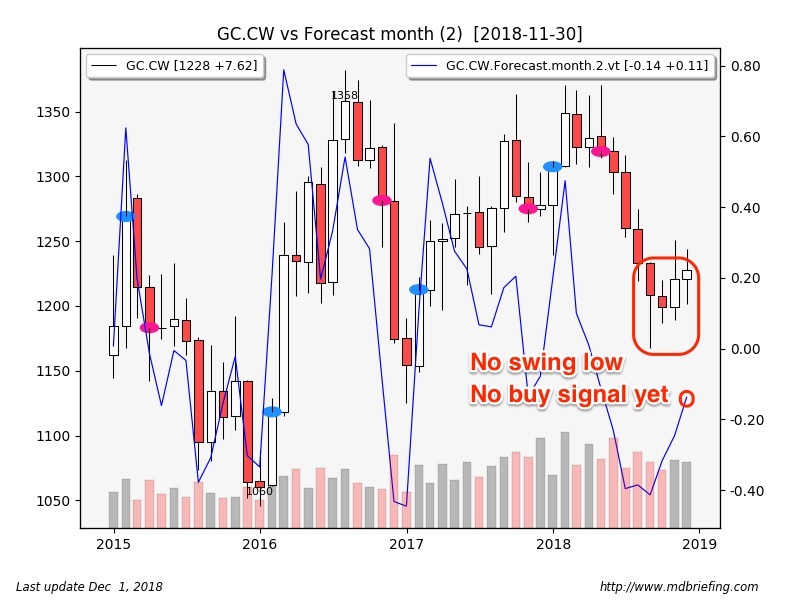 The resulting bullish harami candle print looked strong (66% bullish reversal), and the monthly forecaster issued a buy signal. I suspect there will be substantially more gains next week after the interim settlement with China on trade at the G-20. The sector map had sickcare leading (with a new all time closing high for the sector on Friday – perhaps healthcare costs have risen to 21% of US GDP) along with REITs and homebuilders, while tech and energy did worst. Tech at the bottom of the heap means a bearish sector map. VIX ended the month at 18.07. Gold moved higher in every currency except the Euro. TLT rose +1.54% this month, making a new low but then recovering. Long white candle was bullish (53% bullish reversal). TY also rose, up +1.12%. TY printed a monthly swing low/bullish engulfing (80% bullish reversal), and forecaster issued a buy signal for TY. The 10-year yield fell -12.76 bp to 3.02%. How does the recovery in bonds line up with the rally in equities? Well, it really doesn't. 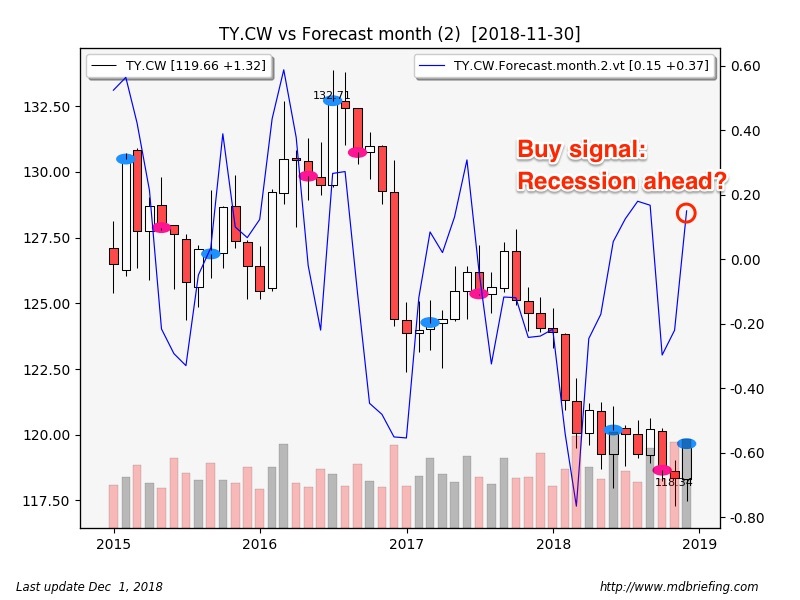 We will have to see how bonds fare next week once the markets price in the tariff settlement, but for now, the steady move higher in bonds is suggesting a recession might be in the offing. JNK fell -1.22% on the month, making a new low. JNK rallied strongly this past week after Powell hinted that rates were “just below neutral”, but the move had no follow-through. We will have to see how JNK performs in the next week once the market digests the tariff settlement news. 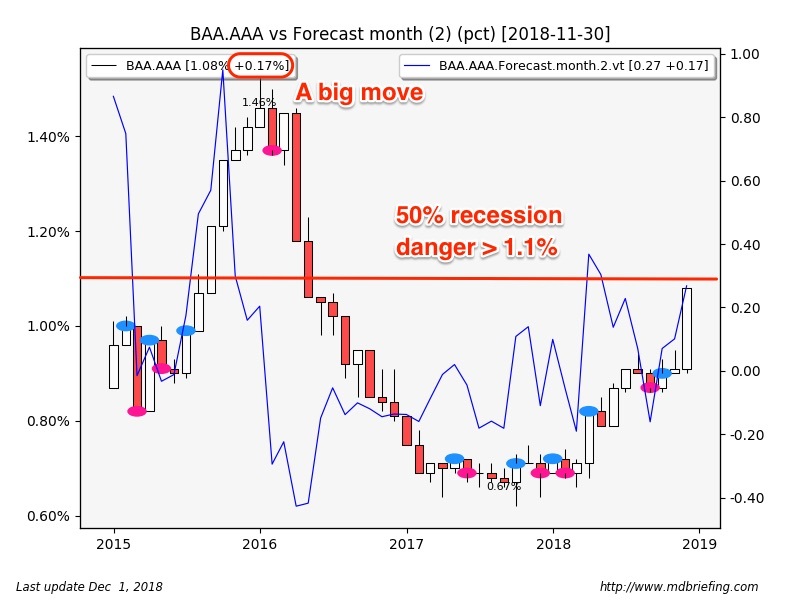 The BAA.AAA ratio staged a very strong rally this month – that's terrible news. 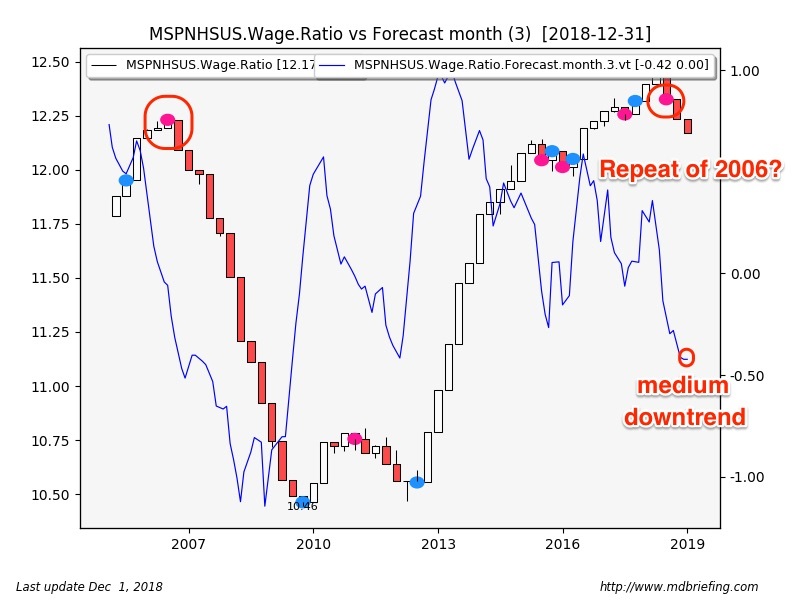 The ratio is now well above 1% and closing on the 1.1% level, which is approximately the level which has been predictive of recessions in the past. Not all moves above 1.1% result in a recession – only about 50% of them – and one recession occurred without a move above 1.1%. The 17 bp move in the ratio was very large. It was due to increases in BAA rates (+11 bp), and declines in AAA rates (-6 bp), which is a clear sign of big money flowing from risk to safety. Crude plunged an incredible -14.13 [-21.75%], the 6th largest monthly drop in history. The opening black marubozu was not a reversal of any sort, and forecaster plunged deeper into downtrend. The previous low at 42.18 could be the next stop, if the pace of the decline continues. OPEC has a meeting on Dec 6th; if they don't cut production, that 42.18 level seems almost guaranteed. Two months ago, Saudi Arabia was saying that $80 was a fine price for oil. 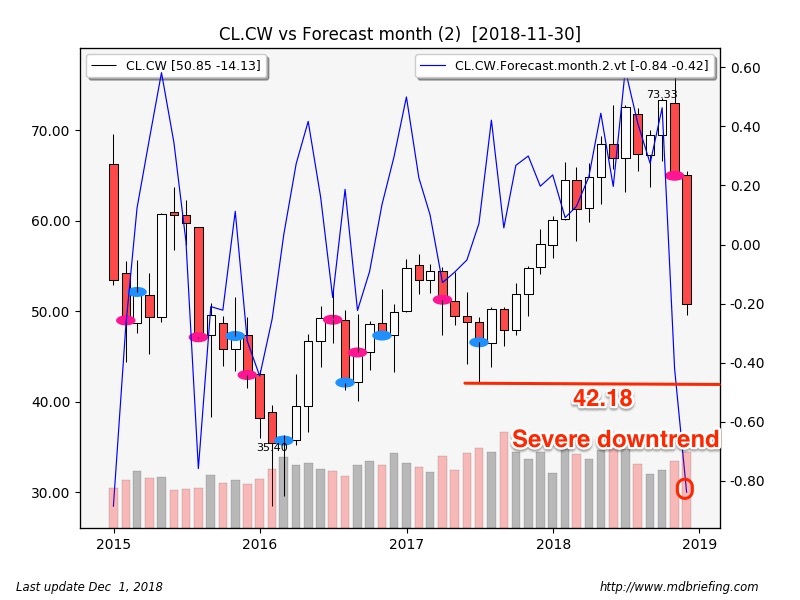 This month, Trump tweeted that oil prices at $54 were fantastic, but that they should go lower still. What a difference two months makes. It now seems clear that Trump has asked for – and received - a quid pro quo from MBS: lower oil prices in exchange for Trump not throwing MBS under the “Khashoggi bus.” For MBS and Saudi Arabia, that was one expensive murder: $5.2 billion per month ($25 price drop x 7 mbpd in exports x 30 days) in revenue losses to Saudi Arabia alone. For those who imagine that Putin controls Trump: this is what it really looks like when a foreign country “owns” your leader. A large jump in US oil production (+416 kbpd, to 11.3 mbpd) this month provided the backdrop for the whole affair. The housing market has continued to weaken; the chart I use to watch it (below) is a ratio of MSPNHSUS (median sale price, new homes, US: a long-dated series going back to 1962) divided by the average US wage (A576RC1/POP). For technical reasons, I need long-dated monthly series that spend time in negative territory, which home prices don't generally do, and that's why I divide the new home sale price by the average wage. You can see that this chart has tipped over a few quarters ago, and is now heading lower. Could this be a repeat of 2006? It is probably too early to tell just yet. Two additional clues: the MSACSR (months of home supply) is now at 7.4 months. That's not good news at all; this indicator usually jumps at or near the tops of the housing market, and 7.4 is a pretty high number. Supply rises because "buyers go on strike." Likewise, HSN1F (new home sales) has dropped fairly substantially too; that has been a pretty good leading indicator of where the overall housing market goes next. * The GLD ETF tonnage on hand rose +8.86 tons, with 762 tons in inventory. * Bullion Vault gold (https://www.bullionvault.com/gold_market.do#!/orderboard) shows a $6 discount for gold and a 12c premium for silver. * Big bars premiums were: gold [1kg] 0.93%, while silver COMEX 1000 oz bars were sold out; the 100 oz bar had a premium of 4.98%. Turkey: the 10-year yield fell -6 bp to 16.20, and the TRY/USD pair fell to 5.18. Turkey remains stable..
Italy – Budget: No change this week. Juncker says he sees progress, claims “we are not at war with Italy”, and urges people not to dramatize the current dispute. Good thing they aren't at war: Italy has an army, while the EU does not. Italy – Migration: Italy distanced itself from the UN migration pact, joining Switzerland, Austria, Australia, Bulgaria, the Czech Republic, Hungary, Israel, Poland, Slovakia, and the United States who have all decided not to sign. Is migration to any country of your choice a universal human right? With climate change, and the coming recession, the question will become increasingly important. Yield Curve Inversion: the 1-10 spread narrowed -12.76 bp to 33.24 bp this month. This was a large move, and it was all driven by a drop in the 10-year yield. At this rate, in another three months, the yield curve will invert. That's a signal of an impending recession. US Congressional Elections, 2018. Final results, House: D+40, Senate: R+3. When viewed from the historical perspective, the Democrat gains in the House were about average, while Republican gains in the Senate were significantly above average. More importantly, Trump has proved himself an asset to the Republicans; some early Republican never-Trumpers have either converted (“Lyin' Ted” Cruz, whom Trump helped get re-elected), or retired (Flake, Corker). My prediction: with R=53 in the Senate, Trump will not be successfully impeached. Side question: is Trump turning the Republicans into a Labor party? It sure looks like it. Go watch Fox's Tucker Carlson for a week. He sounds like a labor activist at least 30% of the time. Talk of “Job Creators” is just gone. If true, it would be a sea change in American politics, which has not had a “pro-labor” party in 30 years – only two enthusiastic “pro-capital” parties that differentiate only along the usual acceptable-to-capital non-money issues. I felt there were three near-term critical events this month: the oil price plunge, Powell's statement that rates were “just below neutral”, and the Trump-Xi settlement at the G-20. Market-wise, the stealth rally in the 10-year has resulted in new lows for the 2-10 ratio (“the yield curve is moving closer to inverting”), which most likely signals an increased concern for recession in the near term. Since the tariff settlement happened over the weekend, it is unclear how that will affect prices of the various instruments. Will bonds retain their bid? Certainly risk assets and commodities will rally, perhaps even oil - and hopefully gold and silver too. It will be interesting to see who jumps in short for each of the commodity contracts. How much of the impending recession sentiment was due to the scheduled 25% tariff imposition that was (formerly) set for January 1st and is now on hold? That's really hard to say. Some of that concern will now unwind. On the monetary front, we now probably only have one more rate cut and then the Fed may well be done. This is a large change in policy, and it was announced at a speech rather than at an FOMC press conference. This suggests the Fed saw this as a time-critical move - they couldn't wait the 3 weeks until the next meeting to tell us all about it. At the same time, the ECB is scheduled to stop printing money this month, while the Fed is rolling off $50 billion in bonds each and every month. The primary visible effect of this is to pull Excess Reserves down from 2.7 trillion to 1.7 trillion. This suggests to me that the Fed is only 1/3 done with their normalization campaign. I expect they will continue normalizing until something blows up, but overall, this is a strong and steady “risk off” deflationary influence. Its hard to know for certain how the US-China settlement will affect prices in the longer term; near term, I would not be short risk assets. We could well see new highs in SPX, and strong rallies in commodities. We will have to see how that affects the rest of the economy; that BAA.AAA ratio is one key metric I'm watching for clues. Housing is another. Uptrend: palladium, utilities, gold/Euros, miners, USD, 10-year Treasurys, DJI, SPX. Downtrend: crude, BAA corporates, housing/wage ratio, platinum, gold, copper, silver. OMG Clapper - look at that face!!! The press was taken over by bankers and their allies in the government and industry back before WWI. TV was taken over by the same forces after publication of the Powell Report. But it is turning out to be a whole lot harder to take over the internet. And most young people are turning away from printed media as well as traditional TV. If you all haven't listened or looked at the Corbett Report on WWI it is well worth it to do so. Also Steve From Virginia's discussion of our current middle eastern wars and their relationship to the boundaries established after WWI as well as the need to keep oil flowing to the west. Chris, could you get Steve Ludlum on one of your interview? He has given a couple of good interviews on KunstlerCast. I'm sure it was a slip o the fingers, but I love being clear on many things, attribution is right near the top. Dave Fairtex is the author of this page and its main content. And I agree - this was an especially gifted and useful monthly wrap-up! Oil down, Fed indicating they will reverse course. Recession here we come? There are clearly many downturns in the price of oil and the Fed hasn't acted, but in some of those instances the FED had already reversed course and were easing as the drops in oil were happening. That Clapper-lying-to-congress video DaveF posted above is really something, given that we know now that the NSA was, at that time and currently, harvesting the entire content of the internet, phone and banking system traffic. A massive and blatant bald-faced lie. Unfortunately, there really is no need for the elite to tell the truth. They own the mainstream media and can be assured that they will NOT be pressed nor confronted on their lies, to their faces, in public. As a result, the population does not come to grips with the understanding that they are being lied to repeatedly, and in a coordinated way. 1. Tell a BIG LIE and release it in a "bombshell report." 2. The gullible public accepts the story and is outraged. The public attitude "needle" is shifted a bit more in the desired direction. Carefully crafted, pre-existing impressions are further confirmed. The group mind is shaped. 3. Allow the story to fade from the news cycle due to a complete absence of follow-up. It is forgotten--somewhat like the Daylily or Hibiscus flowers that bloom and disappear in a single day. 4. It doesn't matter that a few academics come to understand that the story was without factual basis. Most of the public never catches on. The latest example was the Guardian story that Manafort and un-named "Russians" met with Julian Assange further nurturing the story that Russia and Trump are behind the Wikileaks release of the DNC emails. And Manifort's passport stamps do not support. However, the fact that this story was a lie isn't notice by most and doesn't matter. When do we catch on that Luke Harding at the Guardian really is a serial fabricator? Re: oil price chart. Sure I have a comment. It was the oil SPIKE that caused the recession, not the drop. Here's a more complete chart. If oil prices rise strongly enough, it causes a recession. Which is kinda just common sense. Note this crude chart isn't current - the GEM data isn't updating anymore, I have no idea why. What I found interesting was the overlap between the rising oil and interest rates. Oil rises, generally, followed by interest rates. As the FED increases rates in combination with a rising oil price environment, oil then heads lower at some point and that's when the FED pauses the interest rate increases and reverses. Oil seems to foreshadow the rate hiking pause/cuts. Then the recession happens. That's basically the situation we were in, rising oil, rising rates, oil is now headed lower, and Powell just said, that's all we've got, folks. I guess the question is, was it trump's power over MBS, or was it the market that sent oil prices lower, or a combination. Powell I guess seems to think it's the market. Gold's chart looks strong. Its a steady move higher, although it may have run into resistance at 1240. Silver looks a bit less strong than gold - there's some selling pressure, but still in an uptrend. Miners gapped up at the open, but have sold off all day long. They look weak. Copper gapped up big, but then sold off gently all day. Crude gapped up, and then rallied in asia, but has sold off fairly sharply, losing its asia gains. Equities gapped up, moved up slightly before the US open, but have sold off fairly briskly all day long. If it continues, it might even end the day in the red. Today's gap up open was an opportunity for traders to sell. Platinum gapped up, rallied, and has lost most of the rally. Bonds traded sideways, then started rallying sharply just before the US open. They are doing reasonably well. Palladium made a new all time high, and it looks as though it might climb some more. This should produce some interesting candles for tomorrow. Equities in particular don't look very healthy at all. Gold is a surprising winner, intraday-chartwise. It may actually break out to a new high today.